I am an artist and art teacher based in the seaside town of Umhlanga, in KwaZulu- Natal, South Africa. My love of art started at an early age which lead me to study Graphic Design. I worked in the advertising industry and freelanced as an illustrator for a publishing company. With this background I developed a love of fine art and started painting. I undertake commissions for interior decorators, private individuals and I also participate in group exhibitions. My signature works are mainly botanicals and anything to do with nature, sometimes with a twist! I love experimenting with techniques and colours and can’t resist a splash of metallic paint here and there. I am inspired by nature’s vivid colours and the beauty and energy of my surroundings. I am an accredited Golden Artist Educator and am honoured to be sponsored by them. My association with Golden Paints has taken me to interesting places such as Slovenia, where I did some training and also gave a workshop. 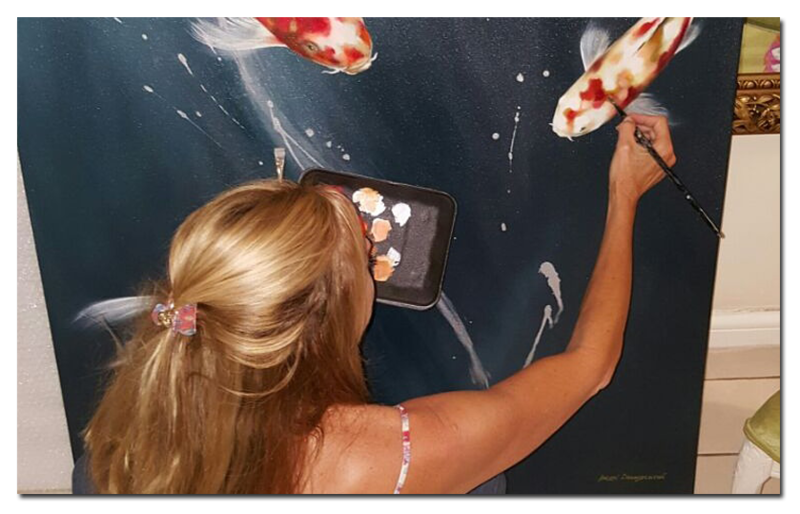 I recently attended the Golden Artist Educator conference in Miami where educators from all over the world got together to learn and share their knowledge. I was selected to present and demonstrate one of my techniques at the conference. A highlight for me was attending the Miami Art Fair which was an incredible experience and very inspiring.